Synopsis: A father, whose son holds special, not-from-earth powers, goes on the run in a bid to protect his son from various people who want to use his powers for their own ends. Review: Imagine if you found out one day that your child possessed special and mysterious powers and that a range of different people, ranging from the government to a religious sect, wanted to take them away for their own means, be this saving the world from what is perceived as a potential extraterrestrial threat. Well chances are you’d be pretty scared and would find yourself on the run in a bid to protect your child from harm. 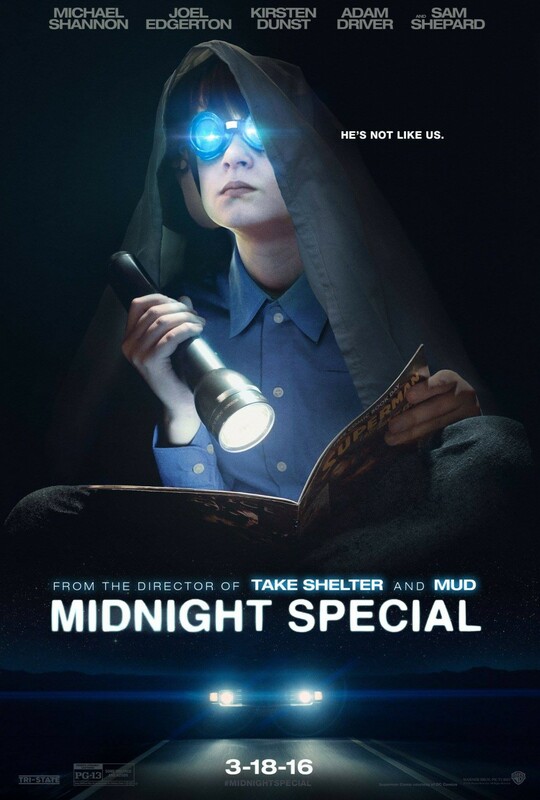 This is precisely the situation that Roy (Michael Shannon) finds himself in as he bids to protect his son, Alton (Jaeden Lieberher) and with the help of Lucas, (Joel Edgerton) they must outrun all those that are coming after them. Right from the get go, it is clear that director Jeff Nichols has been inspired by the likes of Steven Spielberg, with some very possible nods to some of Spielberg’s masterpieces such as ET and Close Encounters of the Third Kind. Not just Spielberg, but 80s sci-fi in general. Yet despite these influences, it does not feel in the slightest like a copy or a rip off, the film definitely has its own style. The intrigue is established from the opening shot, it’s not immediately apparent why these two men are moving this child across the country during the night, the news clearly has an agenda of its own though, perceiving this boy as a very dangerous alien threat with powers that could have dire consequences for the world. Nichols’s screenplay is not afraid to go to some uncomfortable places, such as religion, whilst at the same time going very deep with this and asking some very probing questions about faith. Science and religion are two things that don’t usually go together, but Nichols manages to fuse them both into the story very effectively. The cinematography by Adam Stone is tremendous as visually the film is remarkable. With many scenes taking place at night, the camera-work involved is superb as it actually looks like the characters are in the dead of night. What’s more these night scenes have an eerie feel about them. This eerie feel and tone is something that does run throughout the whole movie as there’s an eternal mystery of his powers. Jaeden Liberher’s performance is haunting and very powerful in equal measure. The chemistry he shares with his father is very believable and Shannon shows what a tremendous actor he is with another fine performance that shine the brightest in this movie. For all of its mystery and intrigue, the film does suffer from pacing issues, there are some moments where the plot slows down to a frustratingly slow pace, which means a little bit of the initial intrigue is lost. Furthermore, the screenplay fails to touch upon certain plot points that would have made the story a lot more enjoyable. Specifically the lack of a back story surrounding Alton and where and or why he got his powers. However, the intrigue and excitement levels increase massively with a very exciting conclusion, that exemplifies the significant power of parenthood and how a bond between parent and child can be very deep indeed. A very ambitious and original premise, but not as rewarding as you’d like it to be. An intriguing concept and premise, with some top powerful acting and wonderful cinematography, but the expansion of certain plot points wouldn’t have gone astray. Great review, which makes me curious to see the film. Thank you very much! Yeah it’s definitely worth seeing!